Is there a way to calculate the total number of items that are selected from a drop-down (value list)? In the attached jpeg, you can see an example drop-down that contains budget numbers. What I would like to do is create a field that calculates the number of budget numbers that have been selected (highlighted) from the drop-down. 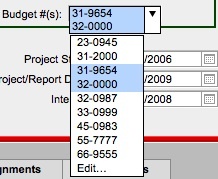 If I select one budget number, I would like the field to show "1." If I select two budget numbers, I would like it to show "2." Look into the valuecount () function.